The U.S. Navy Memorial announced this week a partnership with Periscope Film LLC, which will allow the memorial to screen 120 rarely seen archival Naval films on the site’s Internet television network, Navy TV. The films were salvaged by Periscope Film and will be rolled out through Navy TV over the next year. While making a documentary, Periscope Film founders Doug Weiner and Nick Spark obtained several original 16mm films from World War II, which they intended to use as stock footage for their film. Realizing the historical value of this footage, they began producing VHS and DVD collections of the films. “They proved so popular that we just kept expanding our library, acquiring rare military and aviation footage from World War I to Vietnam ,” says Spark. 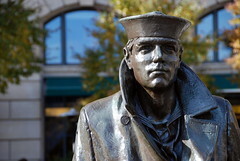 The Navy Memorial, after seeing excerpts of the films on YouTube, contacted Periscope Film to screen the footage. Examples of the collection include “U.S. Navy Blasts Marshall Islands,” a 1942 newsreel that shows the first offensive action of the Pacific Campaign of WWII; “The Fathoms Deep,” a 1952 film containing early footage of French naval officer Jacques Cousteau demonstrating his revolutionary underwater breathing apparatus known as SCUBA; and “Seapower,” a 1968 film featuring Hollywood actor Glenn Ford as star and narrator that shows the fleet at the height of the Cold War. Visitors can watch any of the films free of charge and on demand on Navy TV and can be purchased from Periscope Film.